Stay healthy on your next trip with a probiotic pill formulated for travelers. Rapidly replenish good bacteria throughout the GI tract for digestive & immune support. Each capsule is packed with 12 probiotic strains plus a prebiotic that can reduce the risk & duration of traveler's diarrhea. 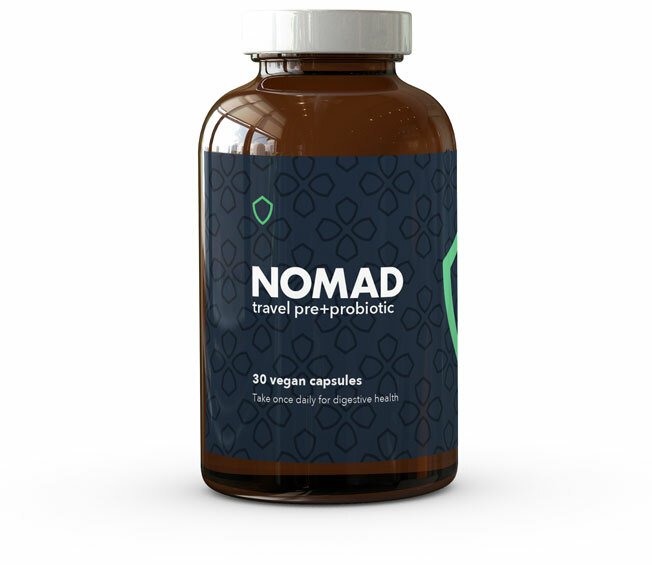 Nomad's travel probiotics have been freeze dried, do not require refrigeration, and have 18-month maturity. Nomad probiotics do not contain GMOs, gluten, dairy, or any animal by-products. Subscribe — Get a new bottle every month. Save 20% per bottle. Helps prevent and reduce diarrhea as well as symptoms of irritable bowel syndrome (IBS). Supports a healthy immune system and overall gut health; helps reduce inflammation. Reduces anxiety, lowers both blood pressure and cholesterol, and is an antioxidant with anti-inflammatory properties. Beneficial for the GI tract, boosts the immune system, and can reduce allergic symptoms. Combats stress, boost immunity, reduces inflammation, and may improve liver function. Supports general gut and immune health, reduces inflammation, and may be beneficial to the liver. Prevents and shortens duration of diarrhea, beneficial for the liver and immune system. Good for GI health, helps combat constipation and diarrhea, reduces inflammation. Good for oral health; antibacterial; also boosts immune system and helps GI health. Second most common species found in breast-fed babies, but known to decrease as you age; known to alleviate stress, and GI disorders. Boosts immunity and helps combat infections; relieves inflammation; beneficial for the GI tract and treating IBS and intestinal inflammation (bloating). Best known for lowering cholesterol and helping people lose weight. Can reduce constipation while stimulating the growth of good bacteria in the GI tract. We were a few days into a 6-month excursion when it happened. Surfing, eating tacos, and taking in the sun on the beaches of Sayulita, Mexico when the first bout of sickness came. Nausea, vomiting, a bunch of time in the bathroom... we'll spare you the details. As the trip continued through Central and South America, we kept thinking to ourselves "there must be a better way." After a stint in a Medellín hospital, we decided enough was enough. Once we realized there was no probiotic geared to the challenges of food and bacteria all over the world, we decided we'd make our own. We quickly became fascinated with the natural power of probiotics and the importance of a healthy, fortified gut. After conducting research and exploring the market, we believe we have found the most fortified probiotic for travel, as well as for anyone who wants to be healthier and fortify their gut every day at home. 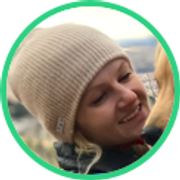 Nomad Travel Probiotic has helped us out all over the world, and has also helped us out here at home in Denver, Colorado. We believe it can lead you to a healthier life, too.